"I just inserted the Pante gold crown. It dropped right in with no adjustments. In addition, the margins were practically undetectable. It was the perfect crown. Thank you." "Thanks for all your great work. Your margins are the best in the state!" 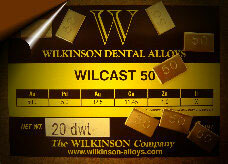 We use a 50% gold alloy for all our full-cast restorations. Because this alloy has a low palladium content (5%), tissue response is favorable over the long-term. This alloy is kind to the opposing dentition, yet strong enough to ensure longevity . All of the alloys we use are manufactured by Argen Corp. We like the quality of their product as well as the integrity of the company. It has been our experience that many labs solve margin discrepancies between crown and die by simply "polishing-up" the margins on the die to match the crown. We don't do that here, so crown margins will always be consistent with what the impression indicates. We work under magnification and spend extra time and care preserving the integrity of the margins.